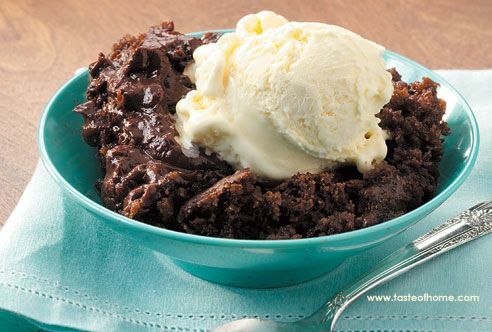 Chocolate Pudding Cake… in the CROCKPOT! Coat the crockpot with cooking spray. Or better yet, put a crockpot liner in it. In a separate bowl, whisk together flour, cocoa powder, pudding mix. 1/4 cup sugar, baking powder, salt, and cinnamon. Make a well in the center and add milk, oil, and vanilla. Stir gently until batter is smooth and then add chocolate chips. Pour the mixture in the prepared crockpot. In yet another bowl, stir together chocolate sauce and remaining 1/3 cup sugar. Pour in the boiling water and stir until smooth. Pour the second mixture on top of the batter in they slow cooker. Cover and cook on HIGH for 2 1/2 hours until the cake is puffed and the top layer is set. Let stand 30 minutes with the cover on, then serve with ice cream. This came out pretty well, although I’m not sure the cinnamon was the best idea. Still, it did set up as an actual cake, with a nice soft center. Next Next post: How’s the weather in Hawaii?